* Coupons are not applicable on items in our closeout section. 7 Watt folding solar panels will charge most of your portable devices that come with a USB charging outlet. IP64 rating, power pack is rain and dust proof. Universal USB port that can charge other power bank’s while the power bank is in use. Includes a USB port (DC output), micro USB (DC Input), power/battery capacity check button, recharging indicator and a LED flashlight. Has 7 loop holes with 5 carabineer clips for positioning the solar panels to get the perfect angel to absorb the most amount of sunlight to charge the power bank. TruColor Large/Wrap/Full Bleed Running Charge: $0.24 Per Sq In Over Std Imp Area. Charging time of 5-6 hours. Due to recent changes in the IATA Dangerous Goods Regulations on Lithium Ion Batteries, this item will no longer be available for delivery via air freight. The merchandise was very good quality and also the printing was excellent. Everybody loved it. Will re-order again. 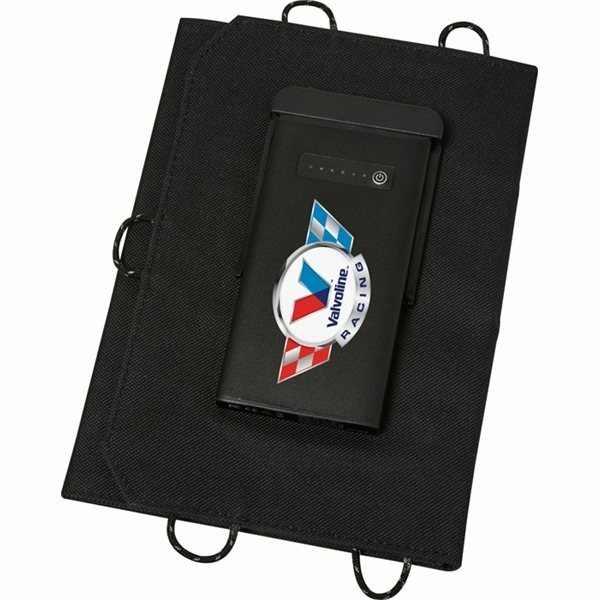 This item looks wonderful with our company logo design. Good quality, product turned out nice. they loved it! Well done! We've had great feedback from it. I had been happy with the end result.